A fireplace is an architectural element consisting of a space designed to contain a fire, generally for heating but sometimes also for cooking. The space where the fire is contained is called a firebox, a chimney or other flue allows gas and particulate exhaust to escape the building. 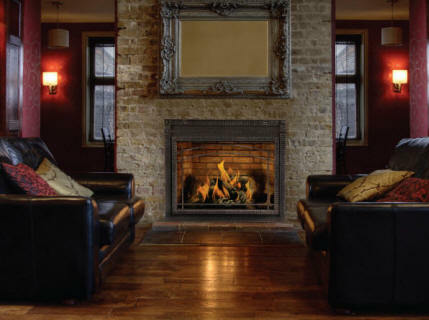 While most fireplaces are constructed in building interiors, sometimes fireplaces are created for evening warmth, cooking or decorative purposes. A fireplace may consist of some or all of the following elements: foundation, hearth, firebox, facing, ash dump door, chimney crane, cleanout door, grate or iron bars, lintel, lintel bar, over mantle, breast, damper, smoke chamber, throat, flue, chimney chase, crown, cap or shroud, and spark arrestor. Masonry (brick or stone fireplaces and chimneys) with or without tile lined flue. Tiles are used to line the flue to keep the corrosive combustion products from eating away the chimney flue lining. Reinforced Concrete Chimneys: Popular during the 1970s to 1980s. Fundamental flaws (the difference in thermal expansion rates between steel rebar and concrete which caused the chimney flues to crack when heated) bankrupted the US manufacturers and obsolete the technique. This type of chimney often shows vertical cracks on the exterior of the chimney which worsen as the internal rebar rusts. Manufactured or 'Prefab' fireplace with sheet metal fire box and double or triple walled metal pipe running up inside a wood framed chase with a chase cover and cap/spark arrestor at the top to keep birds out and sparks in. Within about one hundred meters from salt water this type of chimney is subject to rusting. Otherwise it's competitive to the masonry chimney. IF YOUR FIREPLACE IS THE ORIGINAL DESIGN IT'S DATED AND ONLY ADDS VALUE AS A FIREPLACE TO THE APPRAISER. Fireplaces are often the focal point of a room. We often sit and converse around them while socializing with family and friends. If you live in a colder climate, it is not unusual to fantasize about enjoying the glowing warmth from the fireplace on long, chilly winter evenings. So, why is your fireplace naked when the solution to the dilemma is actually quite simple? Fireplace mantels have been known to transform dull, ordinary fireplaces into lovely places where people enjoy congregating. If you are considering adding a new mantel or updating an existing one, you should take a moment to consider exactly what you desire before getting started. Since there is such a diverse range of options available, you need to have a concept in mind. Cheap fireplace mantels come in a wide range of styles (contemporary, rustic, antique, etc.) and can be crafted from stone, wood, and marble. You will want to choose a material that complements your décor and is able to withstand heat from the fire. Of course, one of the first things to consider when dressing up your fireplace is your budget. Fireplace mantel accessories vary across a wide range of prices and can be quite expensive depending on the material. Your best bet will be to shop around for the best price before settling on a choice. Keep in mind that a wood mantel will be much less expensive than one crafted of marble. Once you have settled on the budget for your new mantel, your next consideration is size. You will need to know the exact dimensions of your fireplace. Just because you have fallen in love with a particular mantel does not mean that it will fit your fireplace. The size of the room is also important when choosing a mantel. Your new mantel should not be wider than the fireplace itself or overwhelm the space in which it is placed. Make sure you narrow down the design choices before embarking on your shopping expedition. If not, you may suffer from sensory overload at the sheer amount of choices available to choose from. There is a virtually an unlimited range of colors, sizes, shapes, and styles available when it comes to fireplace mantels. Having a clear concept of what you want before getting started will ensure you are satisfied with the choice you make. Repainted my fireplace and mantle. Once you have your new mantel in place, you will need to choose accessories that complement the overall design of the room. Two of the most common elements associated with fireplaces are the fireplace screen and tools – both should blend well with the mantel you have chosen. For example, you would not select a rustic tool set for a modern style fireplace and mantel. Other accessories you might consider are a bit more personal. Instead of the traditional logs and andirons, you may decide that fireplace candelabra placed inside the fireplace suits your design tastes better. To further dress up your fireplace, you may choose items such as mirrors or paintings to hang in the space above the fireplace. Living with the same old color design and the exact same furnishings can often seem mundane. A number of the most effective ways to search for tips are on the internet. If you would like for something to liven up your own home, whether is upgrading your restroom, living area or just putting in a couple of stylish touches here and there one of your best methods certainly is the internet. There are actually a variety of resources over the internet, one can find existing sites specifically to aid you plan out your space. On the web you’ll find websites that allow you to enter your room and they allow you to mix and match tones and/or furnishings. Should you be scrambling for ideas on how to decorate your space don’t pay out lots of money on mags. You will find just about all on the web; nearly all mags have got a webpage where you could look up inspiration and ideas. A large amount of on-line design mags contain useful programs to help you map out the new décor. There are several weblogs available with hints and D.I.Y. guidance and they are generally so easily available with the click of the mouse, there really isn’t a better spot to search for suggestions in comparison to the online world. A lot of online issues of design and style mags also have hyperlinks for getting the piece of furniture utilized in their content articles, which I find very useful sometimes. Think of the internet as being a big treasure hunt, internet sites like Etsy and Ebay are packed with fascinating stuff. The secret is to do research. I begin by measuring the room or perhaps the place I have to decorate and next make use of an online system to play with. Once i establish where everything is going I start looking at textiles. Now, textiles are a tricky thing to purchase on the net given that although you may like the brief description for the pure cotton print, it does not really mean when you finally get it in the postal mail it truly is everything you were looking for. So what I do is: I search for a number of differerent materials online I want to make use of and pick out just a few I would like to basically literally sense by using my fingertips, compare costs from various dealers, then I set out and get them. You may want to purchase samples, but if you are not a big brand name in the design market place often you may have to pay for these. 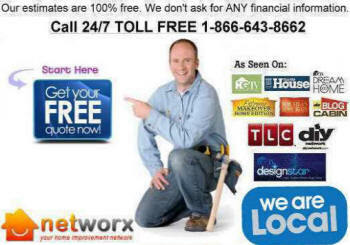 I Need Find Best Local Near Me Fireplace Painters Builders Stone Brick Remodel Cost contractors. Call ☎ Today FREE Quote (Low Cost) Painted Brick. Having your firewall bricks painted adds a cool and contemporary look to the said and the entire room. Just use a paint color that would complement your house wall coloring and definitely you would go no wrong.